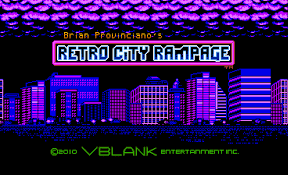 VBlank Entertainment headed over to the official Playstation Blog to announce that not only will Retro City Rampage DX be coming to the PS Vita, but it will be on the system next week. Retro City Rampage originally launched on the PS Vita a few years back and achieved massive success on the system, both through sales and the PS Plus promotion that occurred a few months after its release. Retro City Rampage DX is basically an overhaul of the original Retro City Rampage that lauched in 2012. The game will feature many new improvements including smaller improvements such as faster vehicles, enhanced visuals, and improved difficulty and challenges. The bigger improvements will include parking garages, ability to hijack weapons, a jukebox, a better trophy system, and so much more. The developers called it "a top-to-bottom remastering of just about everything." Retro City Rampage DX will launch on November 11th with a measly price of $9.99, or $7.99 for PS Plus members. The game is definitely worth the small price for some huge improvements. Also fans can buy one version of Retro City Rampage DX and recieve the PS Vita, PS4, and PS3 versions while only paying once. So keep an eye out on November 11th for this revamped classic on the PS Vita store!